Ok, the things with this project is that we have so many ideas that we cannot market each one of them! 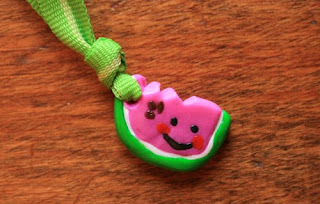 So, a couple of weeks ago, I bought FIMO clay and made this cute watermelon charm. This cutie could be yours for FREE! Yep, I've decide to make a small contest for our shop launch. Just make a purchase in our ETSY shop until June 1st, 2008 and I will randomly draw a lucky winner and send it to this person.